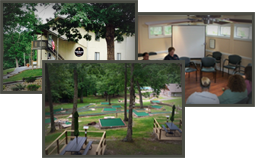 English Mountain Recovery is a residential inpatient treatment center situated in the splendor of East Tennessee’s Smoky Mountains. Rooted in a 12-Step curriculum, our gender-specific programs include psycho-education, group and individual therapy, complementary therapies, and relapse prevention planning. A 12-Step recovery program facilitates long-term sobriety through practical wisdom and spiritual growth. EMR’s 12-Step curriculum teaches participants to find support in a community while embracing accountability, practicing humility, acknowledging mistakes, and seeking forgiveness. Upon admission, each client receives the English Mountain Recovery workbook, which is combined with 12-Step recovery work. Along with 12-Step meetings and workshops, EMR clients are offered holistic modalities such as Equine Interaction Experience, creative arts therapy, meditation and mindfulness, and experiential therapy. Our spiritual advisor works with groups and individuals and can walk you through 12-Step practices or help you seek peace, grow spiritually, and trust in God. Accessibility of meetings and groups. Alcoholics Anonymous and Narcotics Anonymous are found across the globe. Encouragement & camaraderie. 12-Step communities build a rapport with one another and give people the opportunity to enjoy fellowship and establish friendships. The 12 Steps are based on the idea that substance dependency is a spiritual and physical illness—and that you are powerless over addiction until you seek help from a Higher Power. However, you do not have to practice a particular form of religion to participate in our English Mountain Recovery program. To find out if our 12-Step-based residential inpatient program is a fit for you or a loved one suffering from alcohol, drug abuse, or another addictive disorder, contact our admissions advisors today: (877) 459-8595 or contact us online.